Installation of your Unobtainium Motorsports front bushing kit is fairly straight forward. Please refer to the illustrations above and in the body of these instructions in order to simplify the identification of the parts in your kit and their installed locations. 1. 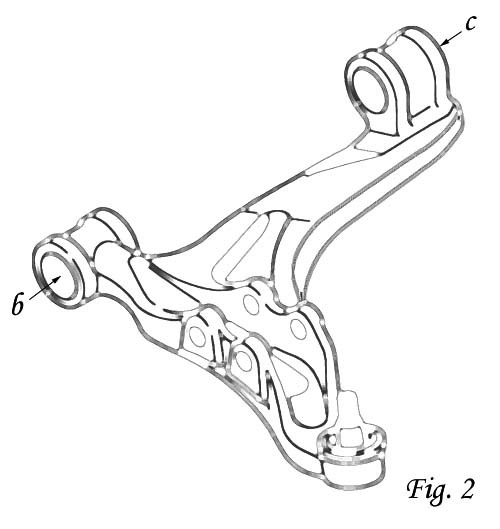 Refer to the Mazda 3rd generation RX-7 Shop Manual for instructions on the removal and replacement of the front upper and lower control arms. Torque values for the suspension bolts will be listed in the shop manual. Please follow those instructions precisely to ensure correct installation of the suspension components. 2. Once the front upper and lower control arms have been removed from the car, use a hydraulic press to press out the OEM rubber bushings, or have a machine or suspension shop perform this service for you. 4. 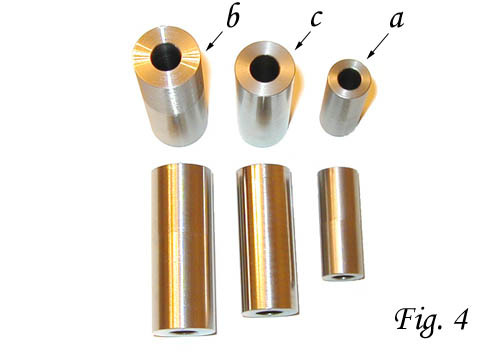 There are three different sizes of bushings in the front bushing kit, as shown in Fig. 3 below. 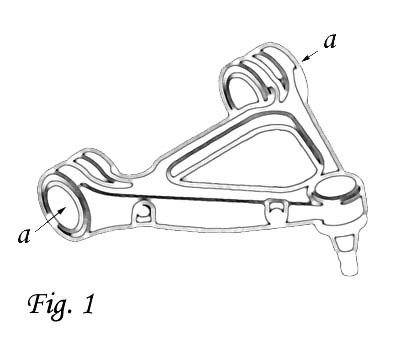 The smallest size, of which there are four, are for the front upper control arms, and are labeled a in Fig. 3 below. Their position is illustrated in Fig. 1 above as a, two bushings for each upper control arm. Press the small bushings into the upper control arm in positions a in the direction of the arrows in Fig. 1 above, so that the flanged ends of the bushings face outward, in the opposite directions of the arrows. 5. Of the four remaining large bushings, two will be obviously longer than the other two. These bushings (labeled b in Fig. 3 above) are intended to be installed in position b illustrated in Fig. 2 above, one per lower control arm. Press the nylon bushing into the lower control arm in position b in the direction of the arrow, with the flanged end of the bushing facing outward from the control arm in the opposite direction of the arrow. 6. 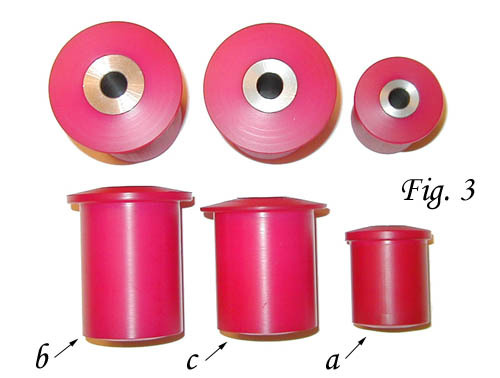 The two remaining large bushings (labeled c in Fig. 3) are intended to be installed in position c in Fig. 2 above, one per lower control arm. Press the nylon bushing into the lower control arm in position c in the direction of the arrow, with the flanged end facing outward from the control arm in the opposite direction of the arrow. 7. Once all eight bushings have been installed, follow the Mazda Shop Manual instructions for replacement of the front suspension components. Before installing the bolts which hold the control arms on the car, coat the outside surface of the stainless steel center pins (shown in Fig. 4 below) with anti-seize lubricant, and slide them into the centers of the appropriate nylon bushings, wiping off any excess. Again, the center pins are designed to be a loose fit and should slide and rotate freely within the nylon bushings. The four shortest pins (labeled a in Fig. 4 below) are intended to be installed in the bushings in position a in Fig. 1 above. The two longest pins (labeled b in Fig. 4) are intended to be installed in the bushings in position b in Fig. 2 above. And finally, the two intermediate length pins (labeled c in Fig. 4) are intended to be installed in the bushings in position c in Fig. 2. 8. Once the center pins are installed in the nylon bushings, you can reinstall the control arms on the car. It is your choice whether or not to coat the bearing surface (non-threaded area) of each suspension bolt which passes through a stainless steel center pin with anti-sieze. While this step is not absolutely necessary, we do recommend it. Install the bolts which hold the control arms to the car following Mazda's torque specifications precisely to ensure a correct installation. 9. Complete the reinstallation of the front suspension components following the Mazda Shop Manual instructions. Once installation is complete, we highly recommend that you have the car realigned by a professional suspension shop in order to ensure that your suspension geometry is correct. 10. Congratulations! You now have the highest performance front suspension bushings money can buy on your RX-7, and you should feel a night-and-day difference in the reaction of the car to variances in road surfaces when compared to the OEM rubber bushings.